(Photo: © Marianne Ejdersten / WCC)Protestant Kirchentag in Stuttgart Germany on June 4, 2015. Tens of thousands of people from Germany and beyond have converged on the city of Stuttgart for a five-day festival of faith, debates, music, worship and culture. Three open-air services in different parts of the city marked the start of the German Protestant Kirchentag, or church convention, which began on June 3 and continues until June 7. The event is Germany's biggest Protestant gathering, taking place every two years in a different German city. It brings together tens of thousands of participants, including personalities from political, economic and national life. The Kirchentag was founded in 1949 by Protestant lay people to strengthen democratic culture after the Nazi dictatorship and the Second World War. The festival also serves as a major forum for debates on such matters as nuclear power, climate change, and the financial crisis. Alongside such discussions, it offers opportunities for worship, music and culture. The event features 2500 individual events in Stuttgart. Speaking at the opening ceremony, German President Joachim Gauck underlined the role of the Kirchentag in motivating people to tackle the major issues of the time. "Poverty, injustice, lack of peace, intolerance and environmental degradation affect people in many parts of the world," said Gauck. "Those who live by faith do not want only to be spectators in the face of such developments. They are looking for responses that will help them to act." Gauck was a Protestant pastor in the former East Germany and became active in the 1989 protests against communist rule that led to the unification of Germany the following year. Alongside Gauck, Chancellor Angela Merkel and former United Nations Secretary-General Kofi Annan are scheduled to address the gathering. Almost 100,000 people are registered for the whole of the five-day meeting. The assembly takes place this year under the biblical theme "That we may become wise," based on a verse from the book of Psalms (90:12). The president of the 2015 Kirchentag, Andreas Barner, stressed the need for wisdom in "how we deal with each other, how we deal with our natural resources, and with our world." At the same time, he said, "The sustainability of our society depends on the extent to which we develop the ability to create and to preserve peace." Barner, a Protestant layperson and business leader, referred in particular to the continuing reports of people drowning in the Mediterranean as they try to reach Europe from North Africa. Such deaths must come to an immediate end, he aid. 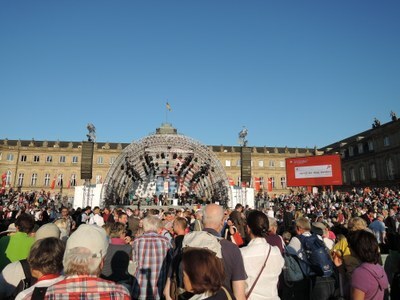 The Kirchentag has strong ecumenical links in Germany and beyond, with more than 5,000 international guests at the Stuttgart meeting. They include a high-level delegation from Korea and large groups of participants from Indonesia and Nigeria. On June 6, the general secretary of the World Council of Churches, the Rev. Olav Fykse Tveit, was to take part in a day of events linked to the Pilgrimage of Justice and Peace, launched by the WCC following its 2013 assembly.